A list of things that people have recommended me to do whilst in the UK. 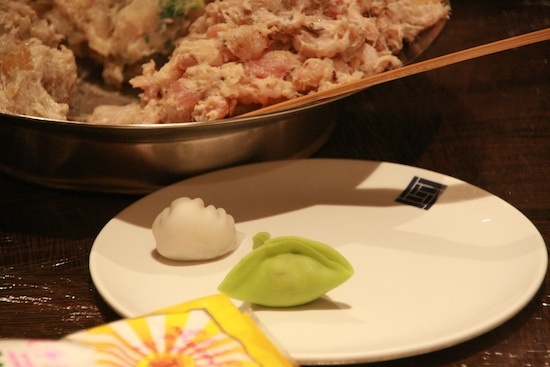 Shanghai Blues is a bit of a hidden gem located off the ever-bustling High Holborn street near to Covent Garden. It’s a hidden gem because it’s so easy to miss it and when its surrounded by tacky high street chains and a number of pubs on either side. 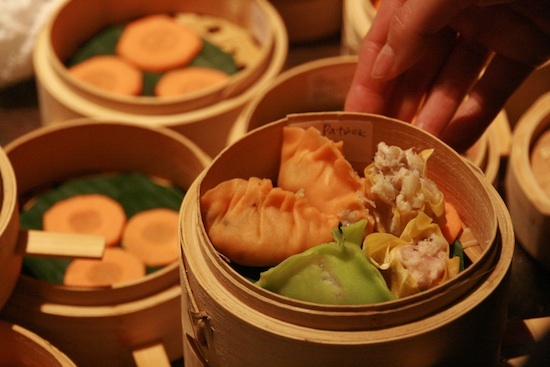 During the week they normally hold some sort of jazz events and their high quality Chinese cuisine (dim sum on weekends) serve to also ensure steady business. I’d read about their Dim Sum demonstration event from a London bloggers website and was excited to hear them re-run the event in September. They even flew Executive Chef Hong Qiu Feng flown in from Canton to help out with this particular event so no doubt it was going to be good. The evening started with a welcome glass of champagne and some nibbles including coated peanuts and picked vegetables. 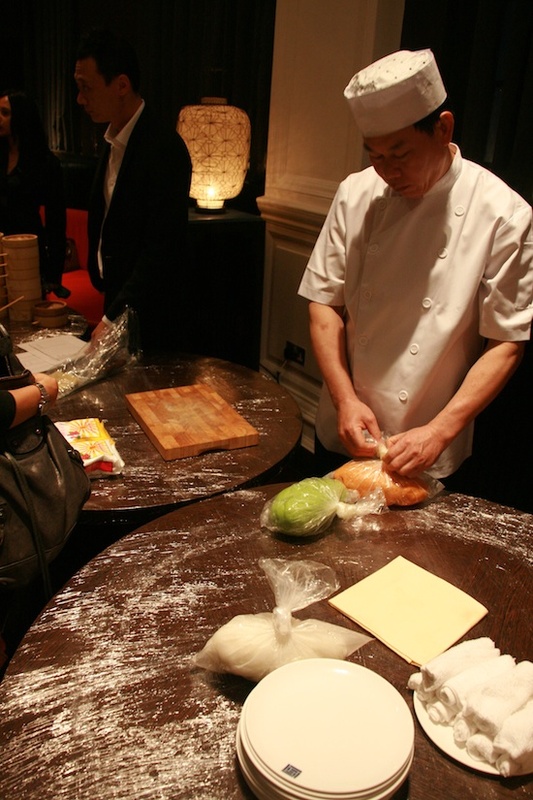 The middle of the dining room had been converted into two large demonstration areas, with the ingredients for the dumplings already prepared and waiting for us eager participants to take part. 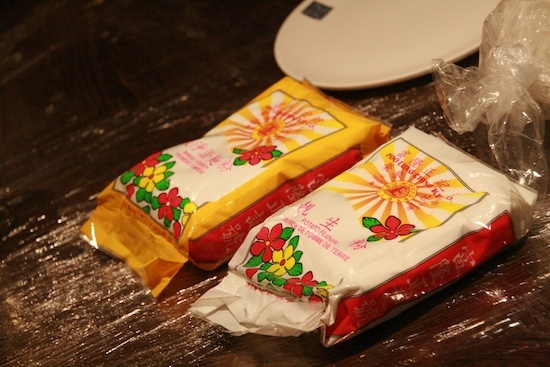 I didn’t realise how simple the dim sum wrapper recipes were (equal parts rice flour + potato flour with some water or coloured juice – spinach or carrot for green or orange). They also prepared the fillings for us (though we walked away with the recipes in a small kit prepared by them) and the heart of the evening ended up practicing filling the dumpling wrappers using methods particular to each type of dim sum. We also got our individually labelled baskets that we got to fill with the product of our making so our we’d get to taste and see the finished products. Considering the entertainment and the great banquet that followed, the cost of the evening was well worth the experience. There’s obviously a skill involved with dim sum making but I didn’t realise how simple some of the ingredients and preparation could be. 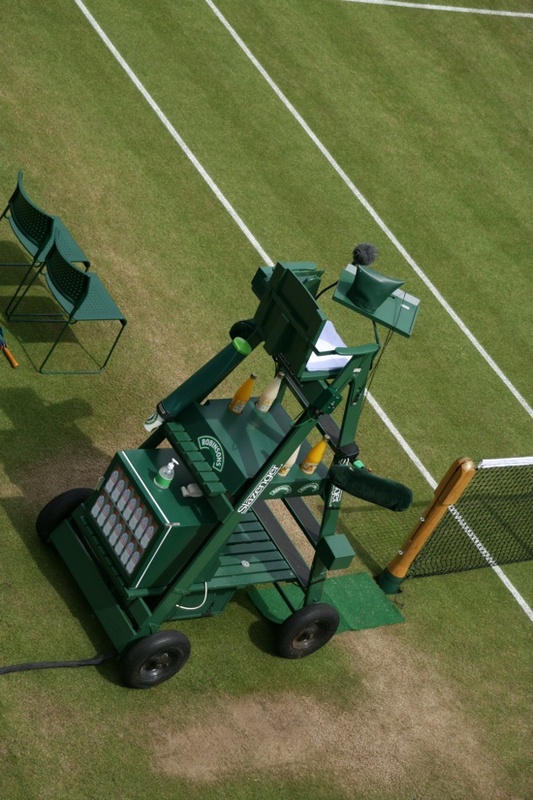 It’s only taken almost five years to finally turn up to Britain’s well known tennis championship, Wimbledon. I applied for the annual lottery – something all residents in the UK can do to buy tickets without lining up, and although I didn’t get any tickets, my sister managed to get some. So off, we went to Wimbledon on a bright sunny, perfectly summery day. The court grounds were heaving, although perfectly civil. 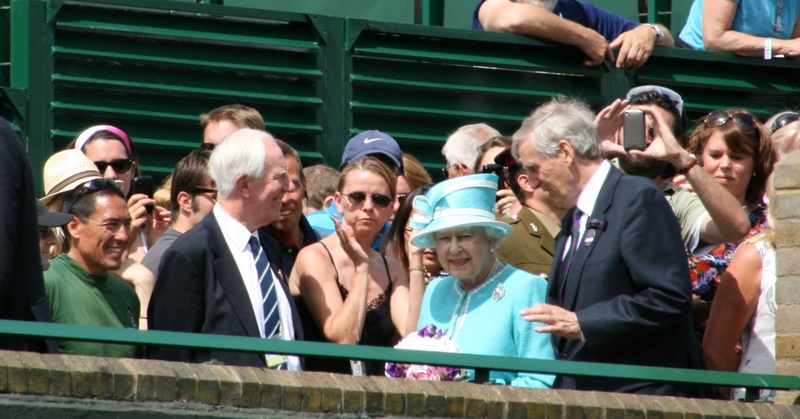 I’m glad we didn’t really have to queue very long to get in, and with allocated tickets for Court 2, didn’t have to line up for a seat for any of the outdoor courts as well. Even if you don’t get a ticket to any of the court games, it’s definitely worth going and indulging in the whole atmosphere. It’s fun and with so many people enjoying themselves, you’ll find it hard not to do so yourself. I’ve always been a fan of alternative design and art book store, Magma and now they’ve extended their offerings with a full on general fun product store. I went in on the weekend and it was very difficult to move around with all of the people there. They place a heavy emphasis on clever uses of recycled material with the complete shelving in their store made out of corrugated cardboard. 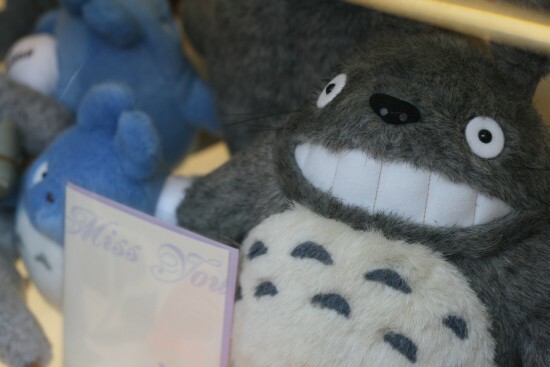 With other funky plush and vinyl toys (like the Ghibli Totoro’s above) and plenty of other gizmos and gadgets, I think anyone will find they can lose themselves pretty quickly in here. Find the Magma Concept Store in Convent Garden at 16 Earlham Street, London, WC2H 9HL. 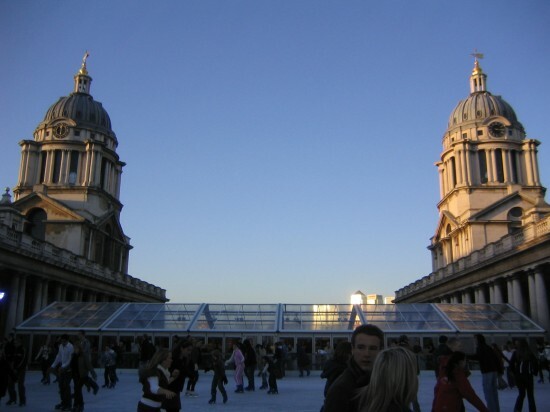 Like most cities that are cold enough to have outdoor ice skating rinks (unlike Brisbane), every year London sets up ten or so different ice rinks in various locations with the most popular including the Tower of London, Somerset House and the one situated in front of the Natural History Museum. Each session is limited to an hour, and even though they operate from early in the morning until 10 at night, with the sheer amount of people in London it can be quite hard getting tickets the week you want to go. Yesterday I ended up going ice skating at the rink situated in Greenwich, a perfect location smack bang in the middle of the Royal Navy Academy. Everyone’s ice skating boots are blue, shiny and look extremely new and even have a little bit more of an edge than other places I’ve been to, but like most hard shelled boots can still cause a little discomfort. The ice skating rinks are not the biggest in the world, so really the most dangerous things you have to be aware of are the other ice skaters. Our session was not as packed out as it could have been, but you certainly had the regular types of skaters in attendance including The Moving Wall (a series of people linked by the hands ready to take anyone out in their way), The Centipede (a line of people behind one another with one person who can actually skate dragging everyone else along), The Indestructible Child ( that kid that keeps falling over but just gets back up over and over again, this time even equipped with a helmet), and The Ice Walkers (those people that don’t go anywhere fast but there’s plenty of leg movement). Outdoor ice skating rinks are fantastic when its cold and Christmas music pipes through the air. It is a completely different experience and even if you can’t skate, it’s quite something to stand amongst everyone and just take in your surroundings (while having a good laugh at yourself). I think I wouldn’t mind trying one of the other ice skating rinks if I can manage to get a ticket. 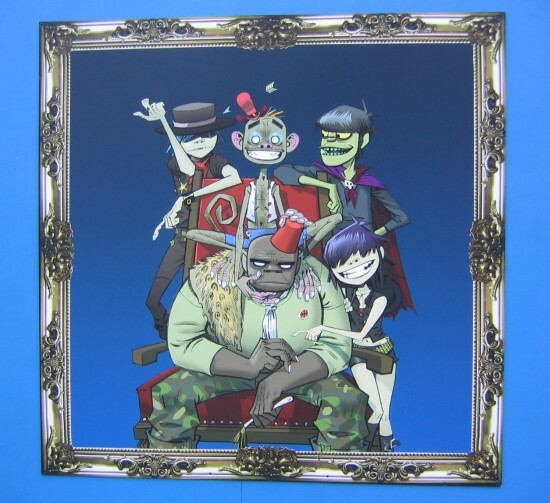 In May this year, Jamie Hewlett, co-creator of virtual band Gorillaz won the ‘Designer of the Year Award’. While refurbishment of Royal Festival Hall is underway, an exhibition showing a mural of his band’s characters is up until February 2007. The series is not large but some of the artwork is nicely detailed and quite large. If you’re in London I suggest taking a look if you’re in the area, or check the rest of them out here. Synopsis: Run by the owners of the chic Bar Italia, this modernised Italian bar fronts a classy multi-tiered restaurant serving delicately presented Italian food. The wait staff buzzed around, talking surprisingly quietly to each other in Italian while the three excessively attentive bar tenders execute orders with amazing precision and speed. In contrast, the ladies next to us at the bar leisurely work their way through a couple of bottles of champagne and indulge in the bowls of free olives that sit at the bar. As per the He Who Knows Challenge, we ordered a round of Long Island Ice Teas that arrived in a flash. These versions are slick, served in the proper rounded tall glass and had the perfect balance between being smooth and tasty (as well as toxic). The result was a drink that needed no help and slid down the throat far too quickly. Atmosphere:Attracting a little bit more of an older crowd, and a certainly better dressed crowd than most other bars I’ve been to, the brightly polished wooden floors and sharp lights set the perfect mood lighting. The elegant dining areas on the multiple floors are filled with white table-clothed tables set perfectly with fine cutlery and glass sets that look like they’re waiting for a fine three course meal to be consumed. Conclusion: A place that certainly wasn’t getting any emptier as the night wears on and proud to declare their commitment to late nights by keeping open until 6am until Christmas, this place is a great place for drinking some fine drinks at equally fine prices in a quality atmosphere. On Tuesday, my team and I finished our second and final phase of my current project, so what better way to celebrate with the customer than by visiting the Absolut Ice Bar? The inside ice bar looks like a very trendy freezer maintaining a cool -5 degrees Celsius and loaded with various furniture and sculptures all made of ice. The drink concoctions are created out of Absolut vodka and more colourful liqueurs and dispensed to you in large glasses also made of ice. Thankfully it’s easy to stay in the cold for the limited session of 40 minutes since you’re given a warm furry poncho-like coat equipped with a gloves and a warm hood. 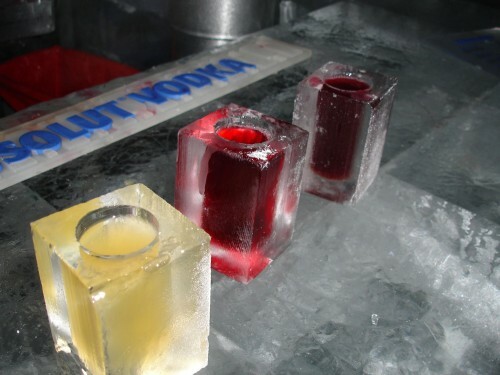 The outside bar is as trendy as the actual ice bar, equipped with modern decor and funkily lit tables. Their drinks menu offers a limited selection of beers but makes up for it with its extensive range of spirits, martini and cocktail mixtures all at equally trendy London prices. We had a fantastic night out on the town and though it’s not an every weekend experience, I think the Ice Bar has a lot going for it.